PATRICK OLDENKAMP became an archaeologist for one reason and one reason only: to find his grandfather's two thousand year-old grave in the Majenica Indian burial ground on a hilltop north of Cambridge City, Indiana. The afternoon discovery of the skeleton wearing a pair of black plastic rimmed glasses confirms that CAREY OLDENKAMP succeeded in his attempt to go back in time. Standing in front of the hollow base of a massive sycamore, the time portal, and to the flicker of a bonfire, Patrick tells his archaeological team his grandfather's spiritual, romantic, time-travel tale of Where The Birds Go When It Rains. Eleven years before the discovery: Carey Oldenkamp calculates he has just two hours before his death. The prospect thrills him. The east wind bears down on him as it returns to claim his soul. He has spent over sixty years believing the first journey was a dream of a grieving brother desperate for a sign from his deceased sister, but the contents of his wife's cherished wooden box prove otherwise. Carey is The Messenger who has failed to carry out his assignment to deliver proof of Christ's birth to the modern world... a messenger who has denounced the very existence of God! Fate gives him only two hours to deliver the divine meaning of the sacred circle Indian mounds, or the message will be lost for eternity, entering the grave with him. This novel is based on the 1968 excavation of the Bertsch sacred circle mound near Cambridge City, Indiana. A new archaeological theory is introduced. If you have ever lost a loved one, may you find comfort through the journey of Where The Birds Go When It Rains. 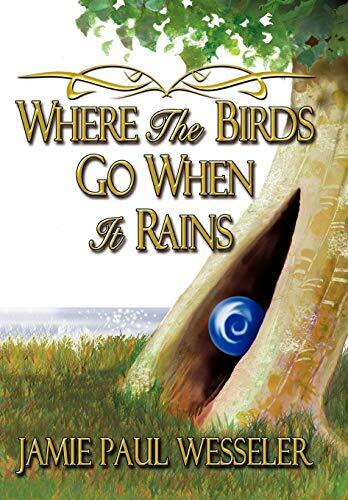 Jamie Paul Wesseler's debut novel, Where The Birds Go When It Rains, is an epic tale of time-travel set in his beloved Whitewater River Valley of Cambridge City, Indiana. In 1968, at the age of ten, Jamie became the youngest member of an archaeological team from Earlham College to excavate a sacred circle Indian mound. In 1972, he discovered the Adena and Hopewell hilltop village of the "Majenica" tribe. He and his wife, Susan, purchased the site in 2001 and plan to reconstruct the ancient village. Jamie introduces an intriguing archaeological theory through the telling of his spiritual tale of romance. He plans to return to his cherished Goose Heaven Road surroundings, at Cambridge City, to pursue his archaeological work and to write additional novels, including a child and young adult adventure and fantasy series.